Supersede Media specialise in helping businesses of all sizes to tap into the limitless potential of search marketing, tailoring their services to the specific needs of each client. One such client, PassMeFast, offers driving courses across much of the north of England. 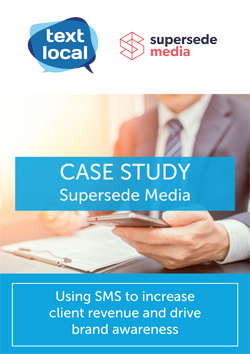 Supersede Media used Textlocal’s SMS platform to send reminder messages, raising awareness of their brand and making sure customers don’t miss any of their great promotions. For PassMeFast, the team were able to use the system to vary the messages depending on factors such as a customer’s prior driving experience, transmission preference and personal requirements. Textlocal’s keyword-to-short code functionality also offered a quick and easy way for potential customers to get in touch with PassMeFast about booking. In addition, the ability to use different combinations of keywords allows Supersede Media to track how the campaigns are performing in different areas and across different media, such as radio campaigns, leafleting, and advertising on Metrolink. One of the most successful SMS campaigns Supersede Media launched for PassMeFast has been the Black Friday send, which saw them offer discounted courses in a one-day sale. As a direct result, PassMeFast took over 100 calls and sold 44 driving courses, with a total revenue on that day exceeding £22,000.